The tissues covering the brain. The attaching structures at the base of the brain. Muscles and blood vessels around the scalp, face, and neck. 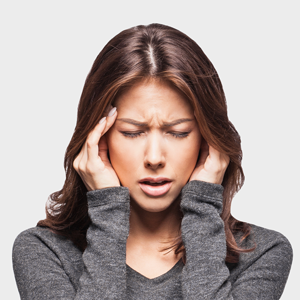 Headaches are often caused by different stresses, whether it is physical, chemical, or emotional. Despite being triggered by stress, the root of the headache is usually a traumatic event or repetitive motion that eventually causes misalignment and pain. Traumatic events can include whiplash, contact sports, car accidents, and other injuries. Repetitive motions that can lead to headaches include postural habits, work tasks, and repetitive lifting and turning. However, these injuries do not automatically cause headaches, as some headaches and other symptoms may take even years to surface after these events. Headaches have commonly been treated with medications such as aspirin or Tylenol. In fact, Americans consume 80 billion aspirin tablets each year! Aspirin, which is the active ingredient in more than 50 over the counter medications, may temporarily relieve the discomfort of the headache, but does little to correct the cause of the problem. Moreover, its use has been associated with bleeding ulcers, Reyes syndrome, and Kidney disorders. Taking painkillers on a regular basis can also make subsequent headaches even worse, causing a condition known as “rebound headache” or “medical overuse headache”. In fact, “Chronic use of aspirin actually promotes chronic tension headaches,” according to Lee Kudrow, MD at the California Center for Headaches. Studies have shown that over 70% of headaches come from problems with the cervical (neck) region of the spine and its connected structures. These misalignments often cause irritation of the nerves in the neck, which, when unaddressed, creates tension in the neck muscles, and ultimately leads to headaches. Misalignments such as these are caused by the traumatic events and repetitive motions discussed above. That is why regular chiropractic adjustments can actually help decrease or even eliminate chronic headaches.